= Kaimono ni itte kite kureru? = Can you go shopping for me? Verb + （し）てきてくれる？ ( = ~ (shi) te kite kureru?) = Can you go+ ing for me? When you ask someone to do something for you and come back to you. = Kaimono ni itte kuru. = Kaimono ni itte kite! Asking someone if they can go shopping for you. So when you ask someone to go somewhere to do something for you and you expect them to come back. Sounds nicer if you add くれる ( = kureru) in the end. = Can you go check and come back for me? = Yoyaku wo totte kite kureru? = Can you go make a reservation and come back. = Kuriiningu wo totte kite kureru? = Kuriiningu wo totte kite kuremasuka? Kyou wa risuningu no mini tesuto desu! Onsei wo kiite mondai ni kotaete kudasai ne. OK, let’s try a mini listening test! Listen to the sound and answer the questions. Doko ni tomodachi wo kaimono ni ikasemasemashitaka? Where did she send her friend to do her shopping? (tomodachi ni) yotsu no mono wo tanomimashita ga sore wa nan de shou? She asked her friend to buy 4 items. What are they? （zenbun) Ima kara suupaa ni itteringo to gyuunyuu to tamago wo katte kite kureru? Sorekara doggu fuudo mo wasurezu ni katte kitene. (script) Can you go to the supermarket now and buy me an apple (or apples), eggs and don’t forget to buy some dog food! = Maggie wa nanto iimashitaka? = What did she say? = (Kotae ) 1000 en watashite oku kara otsuri de sukina mono katte iiyo. = (Answer) I will give you 1000 yen so you can buy anything with the change. Can you hear all of them? This one got me a little bit confused since it seems like both of them are the ways of asking someone for a favor..
First, let’s compare the following examples. shite kureru? = Can you do ~ for me? shite kite kureru? = Can you go somewhere and do something for me? Shite kite itadakemasu ka? = Could you go somewhere and do something for me? If you want to learn more about asking for a favor go check this lesson. 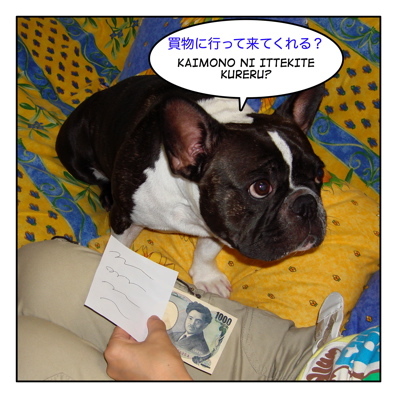 te-form + kureru (or kuru, etc…) can modify a noun? I know that te-form + iru/aru can modify a noun, but… if not, why can not? Ex. 母が送ってくれたシャツ= The shirt that my mother sent to me. Ex. いつも友達が貸してくれる自転車が壊れた。= The bicycle that my friend always lends to me got broken. The te-form and na-adjective modify the noun at the same time? or the te-form modify the na-adjective and this modify the noun? The beautiful dress that my mother bought for me. I have 3 questions in this topic. The concept of having to explicitly mention doing something and then come back is rather unique for Japanese language. When I first started learning Japanese, I cannot understand the purpose of having to say ‘go do something and come back’. I have also asked Japanese friends but maybe because it is instilled in them since young, it is hard to explain why the need to include てくる. I mean, what is the difference between トイレ二行ってきます and just トイレに行きます? So I was thinking, whether you could give some scenarios where it is not correct to include てくる? Maybe I can understand it better that way. I also used to think that てくる is for doing something and coming back in a short while; at most within a day (and is that why they always say 行ってきます！?) In that case, is it alright to say 明日日本に行ってきます? I hear my Japanese friends say something like フランスに行ってきました when they came back from abroad. But overseas trip usually last many days and what if one does not yet know when is the time to return? I am not sure if you have done any lesson on this but I always have a problem understanding the proper use of 言う. Because sometimes they use 言いました, sometimes 言っていました. 1) トイレに行ってきます insinuating that the speaker is going to the bathroom and comes back later. It doesn’t matter when the speaker is coming back (short time or long period of time) but the both speaker and listener know the speaker is coming back eventually. 2) Yes, I have a lesson so please read it first. This is a great lesson like always. and what is the “ni” after “wasurezu”? 2. What is the vocabulary for “beginner level”? 1. ~ずに is one of the lessons that I am working on right now. = to take exams without preparation. = To go out without having breakfast. に here has a function of emphasizing. 2. You mean what is the 初級レベル vocabulary? I have several “Super Basic Words” lessons so please go check them. I googled for some examples and I think it means “are you beginning to understand?” Am I right..? I am happy to hear that! Thank you for the nice comment! Great .. ”くれる”　is clear now :D plus with a great listening quize, really thanks sensei. Hello! Abdullah! Thank you for your first comment here! こと is used to make verb a noun. Ex. I love making people laugh. Ex. It is important to sleep well. Feel free to practice here or on twitter. I can correct you. Cool .. can I use it with adjectives too? > I hate hot weather. > I can’t play tennis very well. OK, I will help you correct the sentences. 1. Sorry! In this case 暑いのは好きではない／好きじゃない will be more natural. But I may make “koto” lesson for you sometime. Thank you for always trying hard! Thank you so much for correcting senseiii.. seems i really need to work on my poor grammer >< i will make a time for ということ　lesson soon inshallah,Seems a long and VALUABLE one. btw sorry for replying too late, I already put my email account! shouldn't the website send a notification to our e-mails? or we have to check everytime? Your grammar is not poor at all. Just need a good practice. That’s all. I once accept your comment, you can post comment without my authorization. It should appear automatically. But if I answer you back here in the comment. I don’t think you will get a notification by email. So I am afraid you have to come and check to the comment section. Sorry! Shokran sensei : ) Ok then i’ll check whenever i leave a reply. I am always waiting for you here! Thank you for visiting this site! Oh…Please don’t be stressed out. Language is fun to learn and it is only a tool for communication.